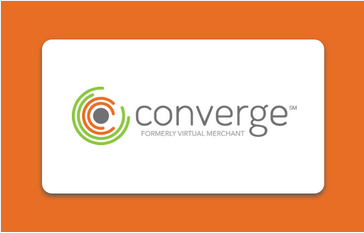 Converge Elavon (formerly Virtual Merchant) module for Magento 2 is a secure and flexible payment solution that lets merchants accept payments online. The module integrates ecommerce websites with the Elavon payment provider, a global leader in payment transactions processing. Converge Elavon for Magento 2 was developed and tested by the specialists experienced in Magento 2 payment integrations, proving its compliance with the Magento Coding Standards. The module enables merchants to manage Converge Elavon payment gateway along with the other payment methods installed in one secure place. With Converge Elavon you can accept different types of credit and debit cards, providing customers with more payment options, while increasing your conversion rates. The Converge Elavon extension helps keep cardholder data safe throughout the payment process, never storing sensitive card details on merchant’s servers. Converge Elavon fully integrates with your ecommerce website for seamless customer experience. The module is a mobile-friendly and cost-effective payment solution, providing merchants with the tools for engaging customers and increasing their sales. Remote API integration allows merchants to collect payment details from the customers’ cards without leaving a merchant’s website. API integration method gives merchants full control over the payments processing flow. Converge payment form is compatible with most smartphones and tablets. The Converge Elavon module allows customers to use major credit and debit cards for payments, including American Express, Diners Club, Discover, JCB, MasterCard, Maestro International, Visa, and Visa Debit. The module allows choosing from multiple currencies at checkout and supports multiple accounts. With the module, a user can set fraud rules to ensure secure transactions, including AVS and CVV checks. Address Verification Service (AVS) is available for UK customers. The module processes cardholders’ information without storing any sensitive data on the merchants’ servers. Card data is sent to Converge Elavon servers to be safely hosted and stored there. A merchant can check Converge transaction report from the Magento Admin to view successful and unsettled transactions, and perform necessary actions, e.g., exporting report in CSV or Excel format. 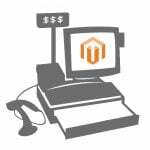 Merchants can access all payment transaction details from the Magento Admin. Module users have full control over the status of transactions and can perform Credit Memo, Void, and Invoice operations. The module allows choosing Authorize Only or Authorize and Capture settings. When choosing Authorize, payment will not be sent to a merchant’s bank account before verification. When selecting Authorize and Capture, the payment amount is immediately transferred to the bank, and invoice is created. 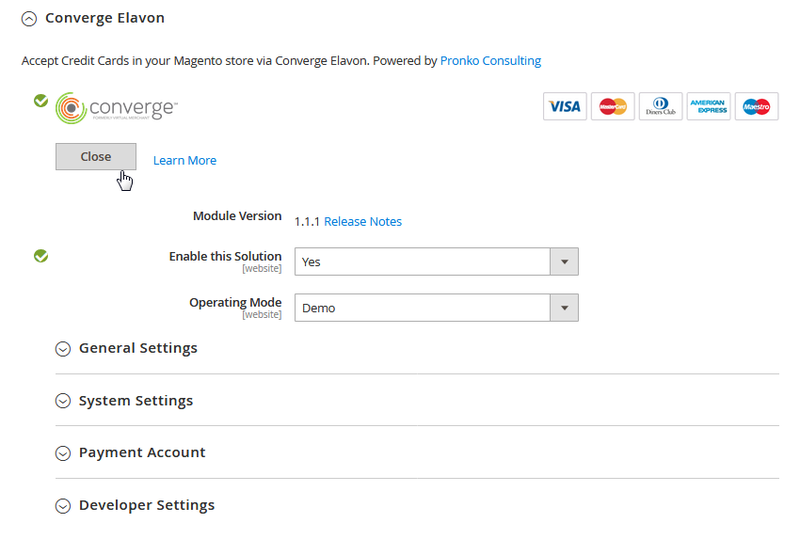 Converge Elavon users can place orders directly from the Magento Admin. Comprehensive error validation allows merchants to get notifications of any data errors or payment amount issues while sending payment transactions. Converge Elavon module provides users with the advanced configuration settings. The module integration can be easily configured to meet any ecommerce business needs. The Converge Elavon development team regularly releases new features and updates the module to ensure the best possible user experience. 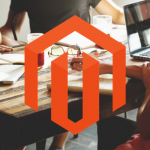 Let’s have a look how the Converge Elavon plugin works on the Magento 2 demo website. After a customer adds some items to their shopping cart and clicks on “Proceed to checkout”, they will see Converge Payment option along with other payment methods installed on your online store. In this example, a customer is provided with the following credit and debit card types they can use for payment: American Express, Visa, MasterCard, Discover, JCB, and Diners Club International. After selecting Converge as a payment method, a customer will be requested to enter their card details. Converge Elavon ensures that customers fill in all required information with a credit card validation feature. Customers can access payment information on their order by clicking on the order number on the “Thank you” page or by going to My Account → My Orders. In this section, we will show how to configure the Converge Elavon module depending on your requirements. 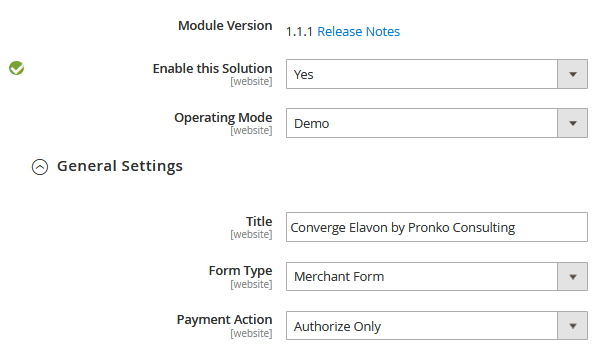 After the module installation, the Converge Elavon option will be listed along with other payment methods installed on your store. You can reach this page by navigating to Stores → Settings → Configuration, and then choosing Sales → Payment Methods from the left-side menu. By clicking “Configure” under the Converge Elavon payment method, you will see all configuration settings of the module, divided into general settings, system settings, payment account, and developer settings. After configuring the module settings, you can click “Close” to reduce the window. 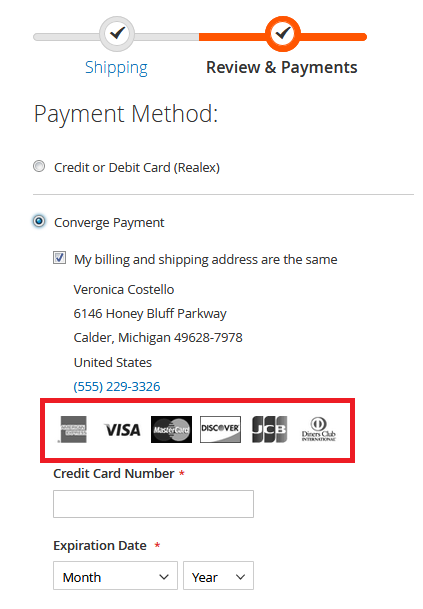 In the general settings, select Yes in the “Enable this Solution” field to allow accepting payments with Converge Elavon on your web store. In the “Operating Mode”, you can choose between Production and Demo mode. If you want to test how the integration works, select Demo. If you want to accept live payments, you can switch to Production mode. 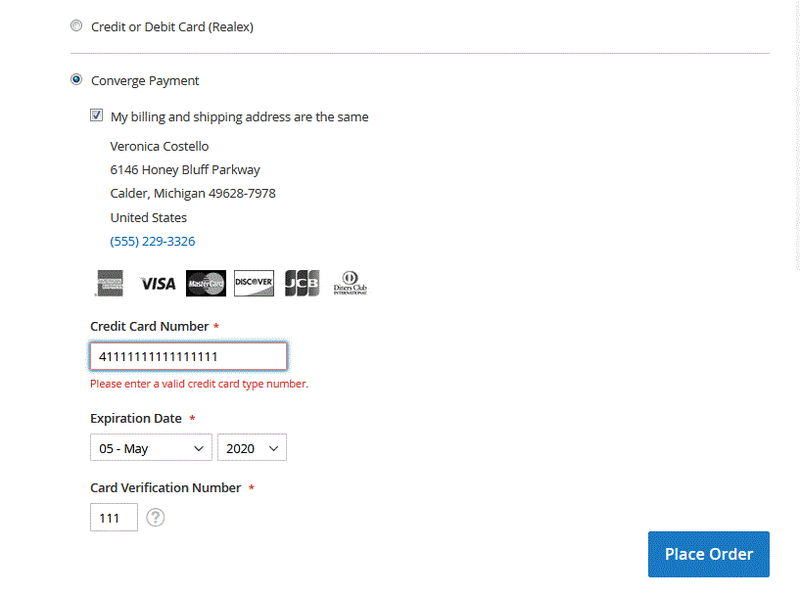 In the example below, we use Converge Elavon by Pronko Consulting as a “Title” for Converge Elavon payment integration, but you can insert any title in this field. “Form Type” setting defines the type of integration. Currently, only Merchant Form is available as a form mode. As for “Payment Action”, you can select “Authorize Only” to only authorize payment transactions, but not transfer the payment amount to a bank. If you select “Authorize and Capture (Sale)”, initial order payment transaction will transfer a payment amount directly to a merchant bank account. Next to the Module Version number, there is a “Release Notes” link. If you click on this link, you will see the changelog of all versions in the popup window. 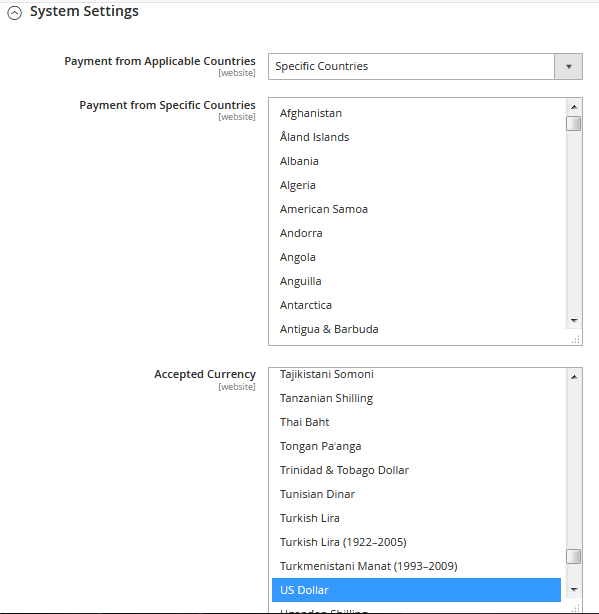 In the System Settings tab, you can define for which countries you would like to allow Converge payment integration. In the “Payment from Applicable Countries” setting you can choose to accept payment from any country or select specific countries. If a few countries are specified, Converge Elavon payment method will be available based on the shipping and billing country selected during checkout. In this section, you can also decide which currencies you will accept on your web store. USD is selected by default. The data in the Payment Account, including Merchant ID, User ID, and PIN, is provided by the Converge Elavon payment provider after you create an account with them. 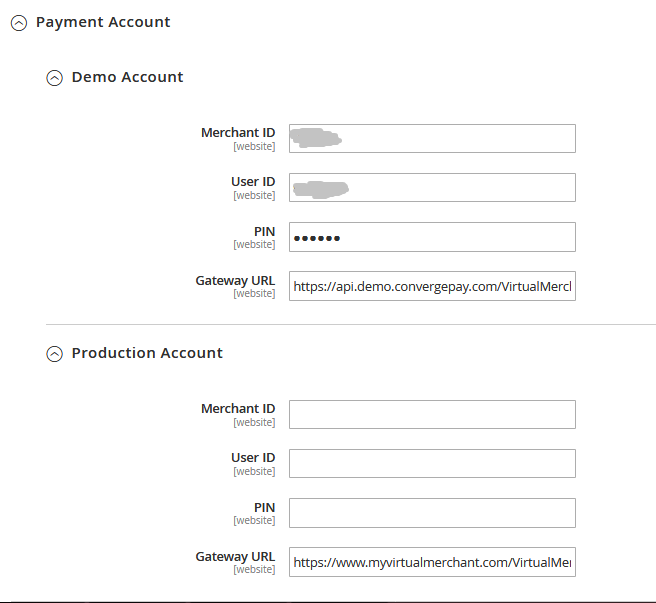 The Payment Account section is divided into Demo Account tab and Production Account tab. “Gateway URL” field contains an API URL used for communication with the Converge production server, and normally shouldn’t be changed. In the Developer Settings tab, there are additional configuration settings for the Converge Elavon module. 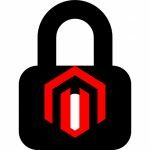 Here you can enable storing request and response queries between Converge Elavon server and Magento 2 in the converge_debug.log file. Converge Elavon users can view all transactions in the Magento Admin if they navigate to Sales → Transactions. By clicking on a record in the grid, you can quickly access the details of a chosen transaction. Another feature provided by the module is a support report. Support report is generated during the module lifecycle. All communications with the Converge Elavon provider are stored in a converge_debug.log file, which is used for validation and testing of the module. The debug_realex.log file is usually located under var/log/ directory inside the Magento application. You can purchase the Converge Elavon extension for the price of $449 as a one-time payment. There is no trial period for the module usage, but you get a money-back guarantee during 30 days. The module package also includes free updates, bug fixes, and support during the first year after purchase.